At Wedding Rings Forever, a wedding ring truly is built to last a lifetime. 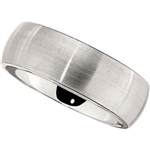 If you're looking for men's rings and you're in the market for a tungsten wedding band, you know that tungsten rings are the new industry standard for quality. Tungsten wedding rings have been referred to as the "Permanently Polished Ring." But not all tungsten wedding rings are created equal. 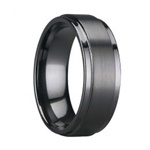 Our tungsten carbide wedding bands are not cheap wedding bands in quality. EVERY SINGLE ONE of the tungsten wedding bands at Wedding Rings Forever upholds quality standards most companies choose to ignore in their wedding bands. Our mens wedding bands are cobalt free. This is VERY important! Most people are fooled by cheap tungsten rings which contain cobalt and take away the qualities of true tungsten carbide. Our tungsten carbide rings are 10 times harder than 18K Gold, 5 times harder than tool steel, and 4 times harder than titanium. Tungsten rings measure between 8 and 9 on the Mohs hardness scale. (Diamonds are a 10 - the highest). Our tungsten wedding bands rings will not bend, scratch, or warp in any way. They are the toughest rings on the planet and will truly last FOREVER. In a medical emergency, our tungsten wedding rings can be easily removed by a medical professional or experienced jeweler. We test each of our hand-made and hand-polished high quality rings. All our tungsten rings also look phenomenal as right hand rings. On any finger, they make a lasting impression of quality and beauty. The newest player onto the market are the new cobalt rings from Wedding Rings Forever. These mens wedding rings are so unique because of their bright white color and their ability to hold stones. Cobalt wedding bands are a shatter proof ring, with a durability rating higher than titanium rings. Many people have expressed the desire to have a tough ring that better matches their companions white gold or platinum band, and cobalt is the solution. We are currently expanding our cobalt bands market with new styles arriving daily. We also do custom cobalt ring design, and the designs can be more intricate as the metal is better to work with. One of the newest trends in high quality wedding rings are the new ceramic rings. 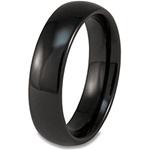 Available in many colors, though the most popular color has been the black ceramic ring. This is not your pottery class stuff here, but rather an incredibly hard and lightweight hi-tech compound which is the solid color all the way through. 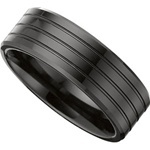 Tungsten rings that are black simply come with a plating, that can scratch and wear off. If you're looking for a black wedding ring, ceramic is the only way to go. Unless you're adamant about having a black tungsten wedding band, the ceramic rings will wear better, be lighter and offer the same look. Simply put, platinum is the best there is. We use only PT950, with the remaining 5% being ruthenium for a lasting shine and durability unparalleled in the jewelry industry. Platinum wedding bands wear much better than gold, and never lose their brilliant color as white gold bands may after time and wear. Though not as scratch resistant as tungsten rings, platinum will always be able to look as good as new with a clean and polish. 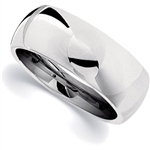 Platinum also looks good on both men and women, and is one of the most valuable metals on Earth. The age old saying, "A diamond is forever!" still rings true at Wedding Rings Forever. We have breathtaking pave rings with upwards of 200 stones that offer sparkle and shine like never seen before. Diamond engagement rings and diamond bands alike are always the way to please your bride. We only work with quality genuine and certified diamonds, unless clearly stated as a CZ. Many of our tungsten wedding rings are set with CZ's for the cost sensitive shopper, but can be swapped for real stones on request. Though tungsten wedding bands are considered our bread and butter, we have been able to help countless couples with a custom diamond ring. In some applications, where cost is a concern, we use the highest quality cubic zirconia stones available on the market today. Call for a specialized bid on any gemstone and dream setting. Custom designs welcome! Please realize that different metals will yield different results, and that tungsten rings will not offer the same versatility as gold diamond rings. Let us save you thousands on your diamond purchase. Gold is timeless and will never go out of style. Whether is be white gold wedding bands, or men's gold rings, we offer anything and everything on the market at the lowest and cheapest price out there. Often times, tungsten rings can be an option for less than half the cost of gold. They match up quite well with your fiances white gold or platinum band. If it's yellow gold you're after, we can inlay 14K yellow gold into a tungsten wedding band for an incredible two tone look sure to stand out and wear better than other gold rings. We have a specialized program for custom design unique gold rings that allow you to see your ring in a wax before it's ever actually cast. Then you can choose to mount a $25 CZ or a $25000 dream diamond with any sort of gemstone in between. If we don't offer the best price, be careful. There are many jewelers out there offering enhanced stones and other product which is cheap and low quality. If you're after a complex design, setting it in gold may be a better option than doing it in a tungsten wedding ring. We now also offer many of our gold wedding bands in X1 white gold, which keeps it's bright white look 4 times as long and is the best gold money can buy.